Bring a large pot of water to a boil and fill a large bowl with ice water. Using a paring knife, score the bottom of each peach with a small X. Add the peaches to the boiling water for 30 seconds, then transfer them to the ice water with a slotted spoon. Peel the peaches, then halve them and remove the pits. Cut the peaches into 3/4-inch dice. In a medium, enameled cast-iron casserole, combine the brown sugar with the vinegar, ginger, onion and cardamom; stir to dissolve the sugar. Simmer over moderately low heat until the onion is slightly softened, about 8 minutes. Add the peaches, chiles and a pinch of salt and simmer over moderately low heat, stirring occasionally, until the peaches are very soft and translucent, about 1 hour. 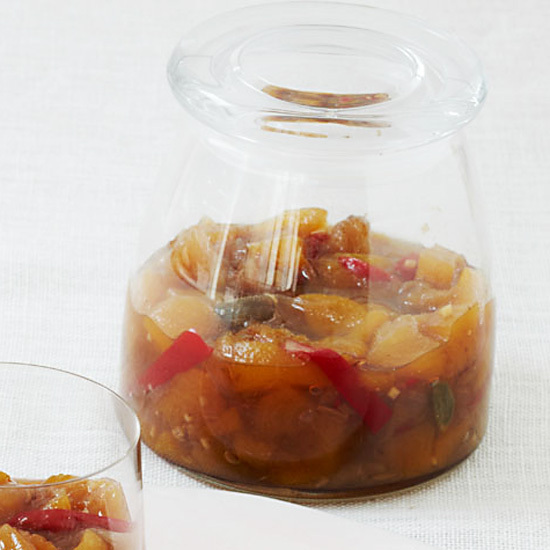 Ladle the chutney into five 1/2-pint canning jars, tapping lightly on a flat surface to release any air bubbles. Seal the jars and refrigerate for up to 6 months.